The federal government issued a sockeye salmon recovery plan Monday that focuses on boosting genetic fitness with more naturally spawned fish and recolonizing habitat -- measures that conservationists say are inadequate. The National Oceanic and Atmospheric Administration Fisheries plan charts a course for recovery of the southernmost population of sockeye that nearly vanished in the 1990s, but has rebounded with stronger returns to Idaho mountain lakes in recent years. Thousands of Snake River sockeye once returned more than 900 miles from the ocean every year to Redfish Lake, named for the color of the returning fish, and other lakes in Idaho's Sawtooth Valley. But the species dwindled from overfishing, dam construction and other development. The recovery plan calls for boosting the genetic fitness of the species with more naturally spawned fish in Redfish Lake and recolonizing habitat in at least two more Idaho lakes. A new Idaho hatchery funded by the Bonneville Power Administration came online in late 2013 to raise up to 1 million juvenile sockeye to further recolonize Sawtooth Valley lakes. "With our support, these resilient fish have already defied the odds by coming back to the extent that they have," said Will Stelle, West Coast Region administrator for NOAA Fisheries. "We hope this recovery plan will serve as an important turning point that advances our shared vision for an abundant, productive and diverse sockeye population that no longer needs endangered species protections." The plan was developed collaboratively through years of work by biologists and other experts from NOAA Fisheries, the Idaho Department of Fish and Game, Shoshone-Bannock Tribes, Bonneville Power Administration, Idaho Governor's Office of Species Conservation and the U.S. Forest Service. It outlines more than 90 specific actions expected to rebuild a self-sustaining population of Snake River sockeye over the next 50 to 100 years. Idaho Fish and Game says the hatchery program boosted returns to 1,579 fish last year, the most in many decades. Research also found that the species is regaining some of its wild fitness, with naturally spawned juvenile sockeye returning as adults at a much higher rate than others released from hatcheries. However, conservationist organization Idaho Rivers United said recovery is not likely to occur until a plan addresses the four dams on the lower Snake River in Washington. "Idaho Fish and Game has done a marvelous job in rescuing sockeye salmon from extinction," said Tom Stuart, board member of Idaho Rivers United. "However, their efforts could be potentially wasted if the survival improvements downriver do not occur, and this plan fails to adequately address the real recovery needs of wild sockeye. The plan incorporates a federal biological opinion that was ruled illegal in August 2011, and it places a huge emphasis on hatchery production to make up for its shortcomings on main-stem survival." Greg Stahl, Idaho River United salmon program manager, said the best measure of salmon health is a lifecycle survival rate, known as a smolt-to-adult survival rate. He said SARs of 2 to 6 percent are needed to maintain or recover the species, far more than the current SAR for upper Salmon River sockeye of about 0.5 percent. 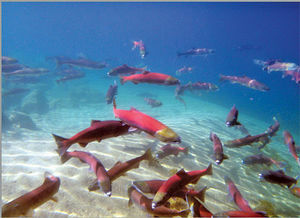 "The plan ignores lifecycle return rates for sockeye," Stahl said. "Sockeye cannot be recovered without improving their main-stem survival, and the only way to do that is to remove dams on the lower Snake River or, in the meantime, increase spill at dams on the Columbia and Snake rivers."